That's all for our live coverage of the FA People's Cup semi-finals. Congratulations to everyone who has made it through to the final day of competition on 25 May. You can see highlights of the weekend's action on Saturday 2 May on the BBC Red Button at 2.15pm straight after Football Focus. comprehensive guide to playing football. #PeoplesCup on twitter to continue the conversation. Enjoying a well deserved lie-down in the sun and looking pretty chuffed to have made it to the final. We don't blame you. It was a pleasure to have you Kidlington Youth FC, keep playing. Grumpy Old Men - This veterans team played in Bristol North today. They came second in their category - hopefully that has put a smile on your faces. Is your Motherwell and Tekkerslovaia - Playing in Dudley this afternoon in the Adult Male category. They can't both emerge victorious but we love the names. Skills 2 Pay Bills - We have two teams with this name playing today, an U14 Girls team in Luton and an U14 Boys team in Shoreditch. We certainly hope you've been showing them off on the pitch today. Warsash Wasps - Try saying that 5 times fast! This U16 Girls team is played in Reading today - and we'll be seeing them play again at the final. Well done! Total Shambles - You can't be that much of a shambles, you've already made it to the semi-finals. Good luck in your matches in the Adult Males category this afternoon. Get Inspired page or email in to getinspired@bbc.co.uk. Commiserations Grumpy Old Men FC. It's been great sharing the highs and lows with you along the way. Congrats to you both, we'll see you at the finals! Can Deep Heat United conquer (team) Pain? penalties - then sudden death. So competitive, but played in a very friendly atmosphere. Brought a lump to the throat. We're wrapping up the filming from Reading after a great day here. Thanks also to the brilliant BBC School Report team, Josh and Jack from Reading School. Sandhurst Sloths are runners up, but still smiling! Look out for the coverage in the Get Inspired highlights with Nick Bright. Details coming soon. Get Inspired and have a go! Nearly time to kick-off in Dudley, the Adult Males category is looking competitive with 11 teams expected to play. Team AC Milads is the youngest team in the playing in Dudley this afternoon. The gloves are on, the sun is out and you look ready to go. Arian: @bbcgetinspired #FAPeoplesCup We have arrived! Semi-finals! Warsash Wasps Girls are another of the teams tackling the Under-16 girls competition at Goals Reading today. They usually play 9-a-side in the Winchester and District Girls football league. "The girls all love playing football and when I suggested that we play in the FA People's Cup they were very enthusiastic," says manager Paul Hammond, whose daughter is part of the side. "They enjoy a challenge and always play with great spirit and determination." Powerleague Manchester South: Some action shots from the Adult Male semi-finals in Manchester South yesterday. There was some fantastic play, a competitive vibe and they have set the bar high. Weybridge Town Girls FC: Just back from a great day at the #FAPeoplesCup semi finals. The girls from Wadebridge played fantastically. A sense of humour is a handy tool in football and the coach of the Sandhurst Sloths, Steve Skinner, reckons that the team name of his U-16 girls shows that they have it in spades. "The 'Sloths' was the captain's idea and a good illustration as to the witty character of the girls in the squad. As 15-year-old girls, they do love to chill out and relax when not playing - ask their mums about the state of their bedrooms and the carnage they leave about the house, it's like a hurricane swept through!" says Steve. "On a more serious note, girls and ladies football has moved forward. Experiences like this will only benefit their development and hopefully ensure that they stay with the game for life." They compete at Goals in Reading today for the chance to make the final. Get Inspired's Chris Whyatt from Reading: Chilly here in Reading for the girls U16s, but the action is hotting up: a great opening game between Kidlington Youth and Caversham Swans... 2-1 it finished. Here are our BBC School Report students Josh and Jack (from Reading School) busily taking notes! Good luck to all those kicking off at 2pm in Portsmouth with Burton FC. Well done to Ole United, champions of the U16 Girls semi-finals in Manchester South. See you at the finals in May. this video with all the best bits from the first round of the FA People's Cup. There's some real gems in there. You might just be in our next highlights film. Caroline Whitfield is something of an inspiration: she runs Kidlington Youth, whom her daughter plays for, having previously had almost zero experience of football. "I became manager because they wouldn't have been able to get started otherwise," she says. "I didn't really know anything much about football but have since taken my FA level 2 coaching badge (not many women have done that, especially at my time of life!) and know tons more now. The girls are lovely, their parents are brilliant and supportive and we all have a great time." They're playing in the U16 girls semis in Reading today, and will be tough to beat. "We've been league champions in Oxfordshire for the last two seasons and unbeaten in that time too," adds Caroline. You are certainly looking awake and ready to go - good luck! Good luck folks. Keep us posted. Ever heard of the Cheshire Champions League?!!! 'Vulcan Galaxy' have qualified for it, by virtue of finishing runners up in the Wigan/Bolton League. But that competition is for next season - today they're battling it out in the girls U16 semis at Powerleague Manchester South. The club are based in Vulcan Village in Newton Le Willows, originally built as a model village to house the railway workers at the nearby Vulcan Works, which closed some years ago. The site of the works is now a housing development and the club lost the majority of its playing facilities 12 years ago, although - after concerted campaigning - three new pitches and a club house will open for the start of the 2015/16 season. Great news. Coach Andy Boyack says: "We're a community-based club and we welcome everyone who wants to play - and guarantee at least 50% playing time in matches to all girls." Fingers crossed for the finals ladies...looks like you have some fierce competition judging from the Manchester South fixtures list. Well deserved. Hope it was as good as the footy. Hello and welcome again to the live coverage of the FA People's Cup. Today is day two of the semi-finals, and the last chance for teams to play their way to Wembley. We had a fantastic day of five-a-side football action yesterday, with teams making it through to the FA People's Cup final on May 25th. If you've already competed or your team is raring to get going today, let us know by sending your best team pictures, messages and tweets to us throughout the afternoon. Recap: What is the FA People's Cup? 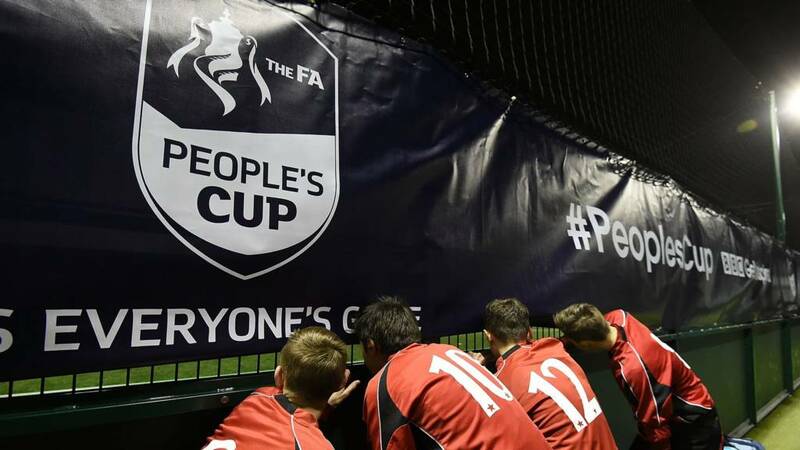 BBC Get Inspired teamed up with the Football Association and the country's leading small-sided football providers to launch the FA People's Cup, a free five-a-side knockout competition which gives players the chance to play in their version of the FA Cup. A total of 4306 teams signed up, making it a massive 30,000+ players. We are now down to 255 teams and 1785 players as we get closer and closer to the final. It's getting intense. For others, it's only just beginning.